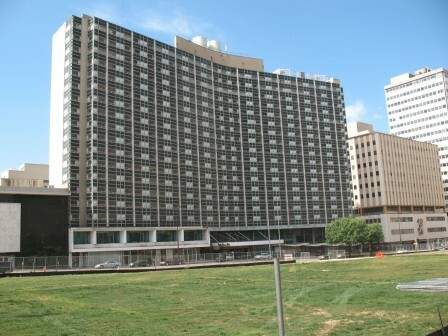 Completed in 1956 at a cost of $16 million, the Statler Hotel was the first major hotel built in Dallas in nearly three decades and the largest convention facility built in the South. It stands 19 stories high and included 1,000 guest rooms and a ballroom that could accommodate 2,200 standing. When it opened, it was hailed as the first glass and metal hotel in the nation. The architect, William Tabler of New York, designed a Y-shaped building that employed a flat-slab structural system, the first full application of its kind. Tabler also designed a thin curtain wall and faced the building with glass and porcelain painted panels. The hotel’s sheer size, bold form and exuberate blue panels make it an icon of mid-century Modern design. Its innovative features, particularly its structural system and thin exterior walls, make it a significant contributor to the Modern movement in Dallas, and for the state of Texas. Today the building sits vacant, underutilized and unappreciated. In 2003, the main building was temporarily saved from demolition, but the parking garage was lost. When an entire city block recently was cleared for construction on a new city park, it opened up views of the Statler, increasing its prominence. The remaining three sides of the park all contain historic complexes. The Statler Hilton Hotel is the only building facing the park that is vulnerable to demolition, and it sits on an increasingly attractive piece of real estate.